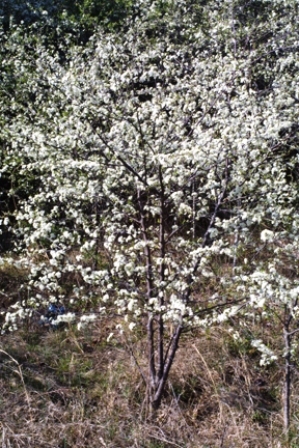 Chickasaw plum is a fruit native to North America. It is one of those fruits which were being cultivated by Native Americans before the Europeans came. The natural population of this tree seems to be decling. This fruit therefore needs to be preserved by planting its trees in home as well as public gardens. 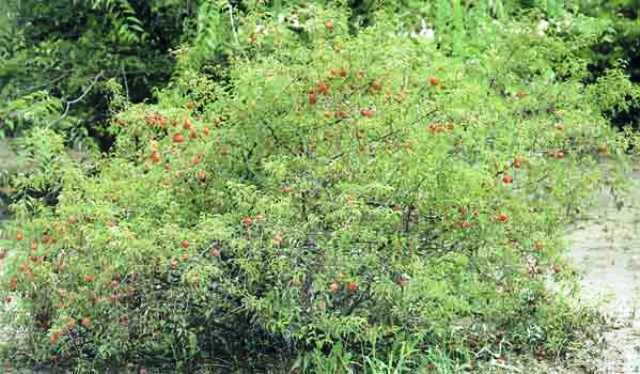 A small shrubby evergreen tree, growing upto 7 m, often found in dense thickets. Twigs Slender, bright reddish brown, exfoliating grayish film, buds are small and reddish with loose scales, often with clusters of flower buds, leaf scars raised, may have thorny spurs. ; bark initially smooth reddish with numerous elongated light lenticels, later developing cracks and splits and becoming rough scaly and shallowly furrowed. Leaves lternate, simple, oblong to lanceolate, fine rounded gland-tipped serrations, 4 to 8 cm long, shiny dark green above, dull and lighter beneath. Flowers small (6-8 mm wide); petals 5, white; anthers reddish orange, appear in clumps in early spring before the leaves. Fruit a drupe, bright yellow to red, round to oval, 1/3 to 1/2 inch in diameter, flesh juicy, ripening in late summer. Though the fruits of chikasaw plum are slightly tart, but these can be eaten. These are also sometimes made into jelly, dessert and preserves. This tree blooms a little earlier than other plants in the spring. 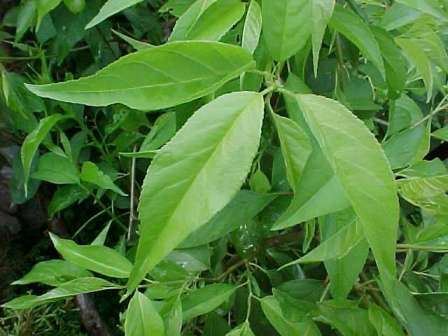 Chikasaw plum also has an attractive bark, small leaves and thin branches. Therefore it is suitable for planting as a flowering tree too in the gardens and parks. 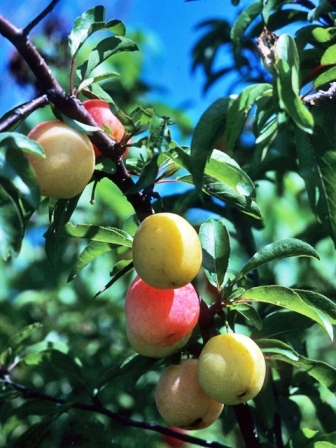 Chickasaw plum, with its attractive bark, small leaves and slender branches, has been used for bonsai. 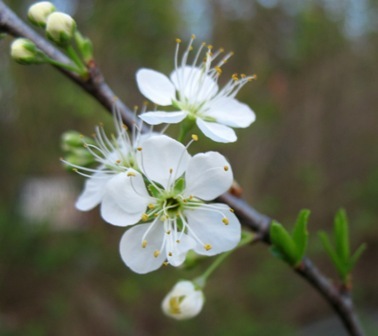 Chikasaw plum is very easy to grow and also needs very little maintenance. It does best in dry, sandy and loose soils with low to medium amounts of water in full sunlight as well as partial shade. It may not do well in alkaline soils. New plants can be raised from seed which need to be cold stratified for 12-14 weeks. Still the germination is not very fast. Cuttings are also not easy to root and only those taken from young, soft wooded tips of fast growing shoots and planted under mist with bottom heat may form roots.